At the Radiology Clinic, we offer access to highly trained specialist radiologists, with extensive experience working in expert centres within the West Midlands. Our aim is to offer you a cost-effective solution to your imaging requirements at a time to suit you with no waiting lists. We work with a number of specialist clinicians, surgeons and professionals to facilitate all your healthcare needs. We have an on-site X Ray and ultrasound scanning facility with access to a network of imaging centres within and around Birmingham. This enables our patients to access to all their imaging needs including CT, MRI and Interventional Radiology procedures. The Radiology Clinic is based at 81 Consulting rooms and occupies a dedicated area on the ground floor offering on site X Rays and Ultrasound scanning. 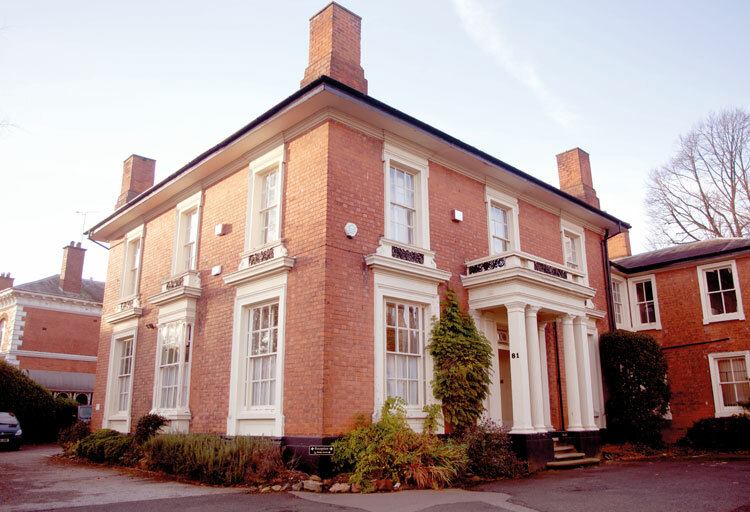 The independent clinic is centrally located within the Edgbaston Medical Quarter and has free off-road parking and wheelchair access. It is a stone throw away from Edgbaston village, with tree lined avenues, green open spaces with many character buildings and award-winning places to eat and stay. At The Radiology Clinic we work closely with your consultant to ensure appropriate timing, advice and management of your care. We can provide advice about appropriate imaging including x-rays, ultrasound, computer tomography (CT), magnetic resonance imaging (MRI) and intervention (Image guided surgery). At the Radiology Clinic we work with numerous expert Clinicians and Surgeons and would be glad to recommend individuals for your care. We have links with all the imaging clinics in Birmingham and can arrange CT & MRI at a site near to you. Recognised by all the major insurers, including: BUPA, Cigna, Police, WPA, Aviva, AXA PPP and Vitality. The Radiology Clinic has extensive medicolegal experience in both defendant and claimant scenarios with expert reporting/opinion and cost effective imaging as required as part of your solicitors report. You can pay for your own treatment / imaging at a time that suits you with no waiting lists. We can arrange cost effective CT & MRI for self payers. Our self pay service is an easy and straight forward route to imaging and treatment which puts you in control. Dr Ian McCafferty is a diagnostic and interventional radiologist working in Birmingham. In diagnostic radiology (DR) he undertakes imaging in Ultrasound, CT and MRI. He has a specialist interest in gastrointestinal, vascular and urogenital radiology with research interests in non-invasive techniques to diagnose cancer early. These include CT Colonography (Virtual Colonography or CTC) & MR Enterography (MRE) for the diagnosis of colorectal cancer and multiparametric MRI of the prostate gland (mp-MRIP) to diagnose early prostate cancer. In interventional radiology (IR) he specialises in a wide range of minimally invasive surgical procedures and has specific interests in Vascular access (Hickman lines & Port insertions), Tumour thermal ablation (Microwave, Radiofrequency & Cryoablation), Urological intervention, Treatment & Diagnosis of Vascular Malformations, Paediatric intervention and Vascular Embolisation (treatment of fibroids and prostate enlargement). Dr McCafferty has a strong interest in research and teaching with over 50 publications in peer reviewed journals including several book chapters. He regularly lectures at national and international meetings on interventional radiology and Prostate MRI. He has written the teaching program for vascular malformations for the European Board of Interventional Radiology (EBIR) examination and is currently the assistant editor of CVIR Endovascular Journal. Dr McCafferty is co-founder of several national societies dedicated to improving education and patient outcomes including the British Society of Urogenital Radiology (BSUR), Interventional Oncology UK (IOUK) and Vascular Anomalies special Interest Group (VASIG). Editor for Cardiovascular & Interventional Radiology (CVIR) Endovascular Journal Vascular Malformations section. Currently Vice President of the British Society of Interventional Radiology (BSIR) home of Image Guided Surgery. Previous Secretary of same Society. Previous Chair of the Education committee and Conference committee. Co-founder and current Council member of the British Society of Urogenital Radiology (BSUR). Founder of the Vascular Anomalies Special Interest Group (VASIG) – UK devoted at research and education in the field of vascular anomalies. Co-Founder and current Council member of the Interventional Oncology UK specialist interest group devoted to image guided cancer treatments. Member of the British Society of GI & Abdominal Radiology. Paediatric and adult interventional radiologist working at QEHB & BCH in Birmingham. Specialist Abdominal and Genitourinary diagnostic Radiologist with special interest in imaging and treatment of prostate, colorectal, GIST and renal cancer, as well as abdominal wall abnormalities, inflammatory conditions of GI & GU tract. Read more about Mr Ian McCafferty on his website at www.ianmccafferty.com. Dr Steven James is a Consultant Musculoskeletal Radiologist and Honorary Senior Lecturer with the School of Sport, Exercise and Rehabilitation Sciences at the University of Birmingham, UK. He initially undertook his Radiology training at University Hospitals Nottingham before completing a fellowship at the Royal National Orthopaedic Hospital, London in Musculoskeletal and Spinal imaging with an emphasis on interventional techniques. He was appointed in 2006 to a substantive post at the Royal Orthopaedic Hospital NHS Foundation Trust, Birmingham. Dr James has developed a particular interest in the diagnosis and management of sports related injury. He works as a radiologist for Premier League and Championship football clubs, Premiership rugby clubs and professional cricket clubs. He also provides radiology services for a number of national sports organisations and was part of the radiology team for the London 2012 and Rio 2016 Olympic Games. Dr James has a strong research interest and has over 85 publications in peer reviewed scientific journals on Orthopaedic, Spinal and Sports injury related topics. He has edited 2 textbooks and written numerous book chapters. He regularly lectures at national and international meetings on musculoskeletal and sports injury related topics. He was previously an Executive Committee Member of the British Society of Skeletal Radiologists. All the main private health insurance providers, including many international and expatriate insurance companies, recognise The Radiology Clinic. It is essential to always contact your private insurance company to obtain clearance prior to any investigation and treatment. The Radiology Clinic's staff can be contacted and provide any necessary information you may need including professional fees and investigation / procedure costs. The Radiology Clinic’s professional fees are typically within the insurance companies published guideline range. The level of cover depends on your individual policy and occasionally you may be asked to make an excess payment. The Radiology Clinic accepts patients who do not have private medical insurance. In fact more and more people are opting to self-fund imaging investigations and even some interventions, often finding the costs are less than they imagined. Private medical care offers a prompt and efficient option at a time that suits you. The costs for imaging examinations will vary according to the type and complexity of scan and the centre used. Please call us on 0121 445 9496 or email info@theradiologyclinic.co.uk for confirmation of cost. Interventional Radiology (IR) is the ultimate minimally invasive option that can treat many medical conditions through tiny incisions, often as a day-case and without the need for a full general anaesthetic. Diagnostic radiology (Ultrasound, CT and MRI) is at the corner stone of early and accurate diagnosis of conditions that allows appropriate and timely treatment. At the Radiology Clinic we offer a full repertoire of diagnostics with strong links to many specialist clinicians who provide therapy. X-ray images are tools used by your doctors to confirm a diagnosis or a clinical finding such as bone abnormality or chest complaint. Some X-Rays are done as part of screening for travelling abroad. Ultrasound imaging uses sound waves to generate an image of your body without the need for radiation. It is a commonly used test which is dynamic and can also look out flowing blood or fluids (Duplex). Common injuries to the body include muscle, tendon and joint problems and these can be evaluated extremely well with high-resolution ultrasound. This can provide a quick and accurate diagnosis to enable prompt management to be instigated. There are a many different injection treatments available to help with orthopaedic and sports related injuries. By using ultrasound to guide injections, the site of the problem can be accurately localised to maximise the effectiveness of these minimally invasive treatments. Magnetic Resonance Imaging (MRI) is a highly specialised form of imaging that uses a strong magnet and radiofrequency waves to generate images of your body. It is commonly used for a variety of medical conditions but has particular uses in Sports, orthopaedic & spinal problems. It also provides vital diagnostic information in patients with prostate cancer, female (gynaecology), small bowel abnormalities and vascular malformations. Computer Tomography (CT) is a medical imaging technique using X rays to generate 2D & 3D pictures of the body. CT scanning is routinely used in an enormous range of medical conditions but commonly for cancer (diagnosis & follow-up), heart, bowel, liver, kidney and lung conditions. Interventional Radiology (IR) is the surgical branch of radiology that uses imaging to guide treatment therapies to their target within the body without the need for open surgery. if you have had a scan and would like us to provide a second opinion please contact us at The Radiology Clinic on 0121 455 9496 or email info@theradiologyclinic.co.uk for pricing and information how to transfer scan. Outstanding professionalism and care with no need for improvement as it met the high standards I was expecting. Thank you for making me comfortable and putting me at ease whilst having injections in my left and right thumbs. I appreciate it all so very much. We are so lucky to have such a brilliant service. Our family’s journey initially involved engagement of four consultants over several years, many words and very little activity which actually mitigated the pain and inflammation that had grounded my son for many months of his childhood. Then, almost by chance, came a recommendation to see Dr Ian McCafferty: From first introduction Dr Ian McCafferty demonstrated considerable depth and understanding of my son’s condition, venous malformation within the thigh muscle, immediately adopting a confident considerate ‘can-do’ attitude, recommending an ‘innovative’ application of non-invasive ultrasound-guided sclerotherapy. Dr Ian McCafferty applied remarkable levels of clinical expertise, skill and dexterity in the application of this technique. Consequently, my boy finally got to experience a very active, outdoor childhood and excelled in so many activities he previously couldn’t have dreamed of. Doc, you’ve changed his life, and also allowed me to be a proud Dad! Thank you for the exceptional care I have received. Everyone involved has been fantastic. Thanks for your initial consultation and diagnosis. I was extremely nervous when I arrived on the ward, but once I met you and you explained the procedure you made me feel totally at ease. Both you and your team were excellent and I am totally satisfied with my port. Thank you for injecting my wrist (now 7 weeks ago), I had a steady improvement and can now write and swim without pain, which has made a big difference to me! Really appreciate your help. After going through treatment for prostate cancer I was devastated to find I had cancer in both kidneys, found whilst having a routine ultrasound. I was offered a open partial nephrectomy surgery. I was very concerned at my age and I didn't want to loose a kidney or even part of it. I was also very concerned about possible infection and recovery time. I looked for alternative treatments and found renal ablation, one being cryoablation, but was only available at specialist centres in UK. I met Dr Ian McCafferty at the Priory Hospital Birmingham, who was very professional and positive that cryoablation would be suitable for my kidney tumours. The procedure was quite straight forward and involved only one night hospital stay with a very quick recovery time. I was so delighted..minimal risks..no complications. My sincere thanks to Dr Ian McCafferty. Just wanted to say thank you for doing my nerve block. There was not much improvement to start with but now I am feeling fantastic so I am so gratefeul. Interventional Oncology is the 4th pillar of cancer treatment using image guided techniques to treat cancers using a small needle. This can include ablation techniques to kill liver, lung and kidney cancers and intra-arterial treatments delivering chemotherapy or radiotherapy direct to the tumour with less side affects. You can call us during office hours - Monday to Friday 9AM to 5PM at the number above, or alternatively, complete the form below and someone will be in touch as soon as possible. Please check your details and try resubmitting again.